To view 7 more pictures, interactive maps and the full, detailed description of the Governor's Grove at Five Forks community, please Login. New construction properties in Governor’s Grove at Five Forks exude modern style yet highlight traditional elegance in each townhouse. These new homes are a homebuyer’s delight as they are low-maintenance and long-lasting. 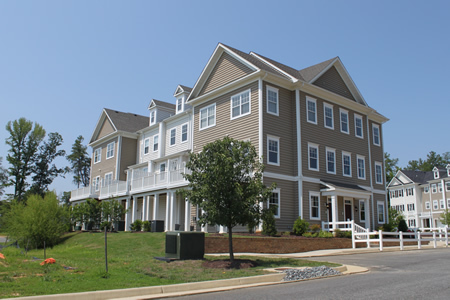 Located in Williamsburg, VA, this development is convenience personified. Military bases like Camp Peary, Joint Base Langley-Eustis and Naval Weapons Station Yorktown are all an easy drive as are medical facilities, banks, shops and schools. Stepping into one of these properties instantly takes homebuyers to a better place. Peace of mind is everywhere in the worry-free interior of these new construction homes. Each townhouse at Governor’s Grove at Five Forks comes with a brick skirt, 30-year architectural shingles, garage, raised panel metal garage door, professionally landscaped front yard complete with sod, nine-foot ceilings, wall-to-wall carpeting, custom kitchen and bath cabinetry, Kenmore appliances, garbage disposal and much more. The first Virginia settlers would surely have envied life in Governor’s Grove at Five Forks. Those folks barely had enough to eat while the residents of this new construction development are living the good life. Owning one of these properties comes with plenty of perks. Swim at the swimming pool, hang out with neighbors at the cabana clubhouse, leisurely stroll through the open spaces or take the kids to the playground. Williamsburg is a place that incorporates Colonial charm into the modern-day world. This historic city reminds visitors of the power of men and women with convictions and ideals. Visiting Colonial Williamsburg, Jamestown and Yorktown can be a royal treat for history buffs. Busch Gardens and Water Country USA, are two attractions that kids are sure to get excited about. Purchasing one of the new construction properties here is something to ponder. Consider if the townhouse and the community amenities will suit your needs. Governor’s Grove at Five Forks is one place where the past meets the present and equals a wonderful future. Send me more information about the Governor's Grove at Five Forks new home community. Our agents gladly offer FREE property tours of Governor's Grove at Five Forks, Williamsburg and homebuyer consultations to all serious buyers. Our Williamsburg SH Pro is prepared to represent you and your interests so you can move into your dream home.